Anthony ‘The Man’ Mundine (45-5, 27 KOs) was in full flight in his six round stoppage victory over future hall of famer ‘Sugar’ Shane Mosley (47-9-1, 39 KOs) at the AllPhones Arena in Sydney, Australia last night. In the 50th fight of his career and having long sought to fight a marquee name in the sport, it was clear from the opening bell the 38 year old Australian was out to put on a performance to get the boxing world’s attention. Mundine possessed a significant size advantage, with his six centimetre height advantage to Mosley looking quite imposing. Upon commencement, Mundine took the centre of the ring and was looking to stalk Mosley. Mundine quickly established his presence on the fight with his trademark jab being used with regularity to find range which caused difficultly for Mosley to work his way into the contest. By round two, Mosley was able to use his powerful right hand to negate Mundine’s offence, but Mundine was still able control the large portion of the round. In round three, the bout heated up with Mosley landing two solid consecutive right hands on Mundine, which set the scene for an entertaining round with both fighters having their moments. In round four, Mosley landed a big right hand on Mundine but the Australian immediately responded with one in kind. From that point, Mundine seemed to have the better of the exchanges and was able to use his jab to great effect and followed up the use of his dangerous right hand with great regularity. Mosley’s only opportunities to strike were using his right hand at the end of a Mundine flurry, which kept the Australian on his toes. By the end of round six, Mundine was in control of the bout with Mosley’s only chance for victory being via knockout. As Mosley walked to the corner at the conclusion of the round, he indicated to his corner of pains to his lower back. As Mosley was set to resume the bout for round 7, referee Raul Caiz Sr and ringside doctor Lou Lewis examined Mosley and it was determined Mosley wasn’t fit to continue and the bout was called off with Mundine declared the winner, taking home the WBA International light middleweight title. Despite the fight not coming to a more definitive conclusion, Anthony Mundine displayed a performance that was one of his best since his 2007 demolition of Sam Soliman to capture the WBA super middleweight title. The key features in Mundine performance was the continual use of his rapid fire jab coupled with his right hand. In the lead up to the bout, Mosley had indicated numerous times his preference of campaigning at welterweight and based on his performance at junior middleweight in this bout, campaigning at welterweight would appear most suitable for him. Being the undersized fighter made it difficult for Mosley to impose himself on the contest for the most part. Will the performance against Mosley attract future big name bouts for Mundine? This remains to be seen, however the performance against Mosley was one of the 38 year old Australian’s most entertaining in many years, his most engaging since his 2009 split decision victory over compatriot Daniel Geale. After fighting a series of lower level fighters between 2008 and 2012 whilst transitioning from super middleweight to the junior middleweight division, the performances of Mundine suffered, which included a shock fifth round knockout defeat to Garth Wood in 2010. 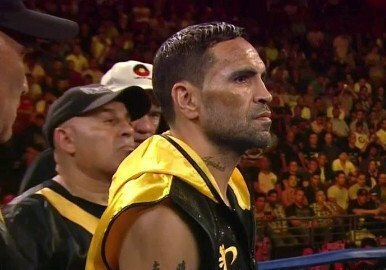 If Mundine can be able to impose this re-energised fighting style in future fights at junior middleweight, he will be able to test the leading fighters of the division such as Austin Trout and Miguel Cotto.